The effects of the June 15, 1991, eruption of Mt. Pinatubo continue to affect the lives of people living near the volcano on the island of Luzon in the Philippines. The eruption produced a large amount of volcanic debris that was deposited on the flanks of the volcano as part of pyroclastic flows. This perspective view looking toward the east shows the western flank of the volcano where most of these pyroclastic flows were deposited. This debris consists of ash and boulders that mix with water after heavy rains to form volcanic mudflows called lahars. Lahars are moving rivers of concrete slurry that are highly erosive. They can sweep down existing river valleys, carving deep canyons where the slopes are steep, or depositing a mixture of fine ash and larger rocks on the gentler slopes. 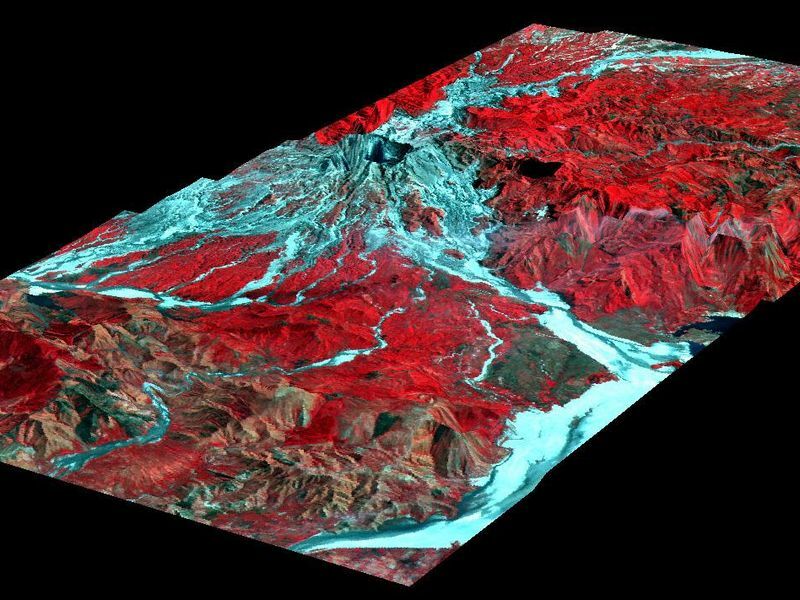 The deposits left from a lahar soon solidify into a material similar to concrete, but while they are moving, lahars are dynamic features, and in a single river valley the active channel may change locations within a few minutes or hours. These changes represent a significant natural hazard to local communities. 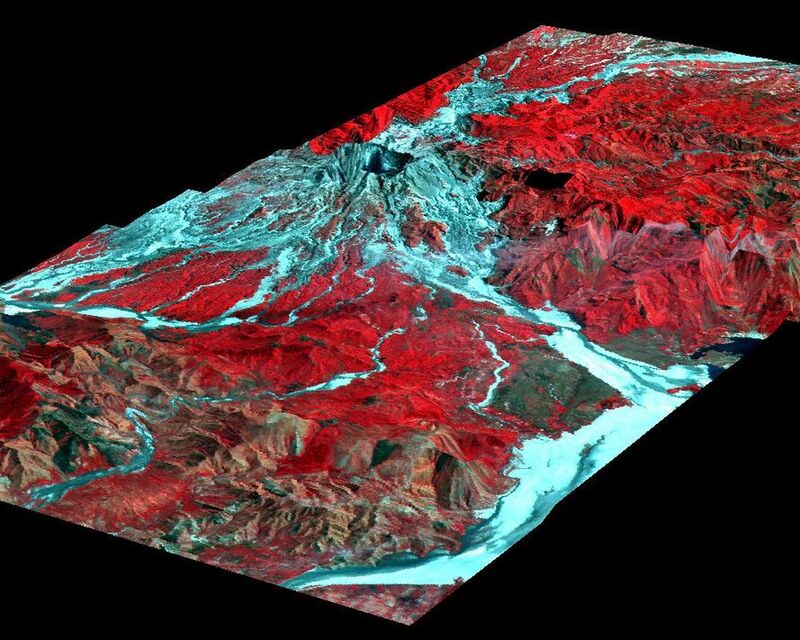 The topographic data were collected by NASA's airborne imaging radar AIRSAR instrument on November 29, 1996. Colors are from the French SPOT satellite imaging data in both visible and infrared wavelengths collected in February 1996. Areas of vegetation appear red and areas without vegetation appear light blue. River valleys radiate out from the summit of the volcano (upper center). Since the eruption, lahars have stripped these valleys of any vegetation. The Pasig-Potrero River flows to the northeast off the summit in the upper right of the image. Scientists have been using airborne radar data collected by the AIRSAR instrument in their studies of the aftereffects of the Mt. Pinatubo eruption. AIRSAR collected imaging radar data over the volcano during a mission to the Pacific Rim region in late 1996 and on a follow-up mission to the area in late 2000. 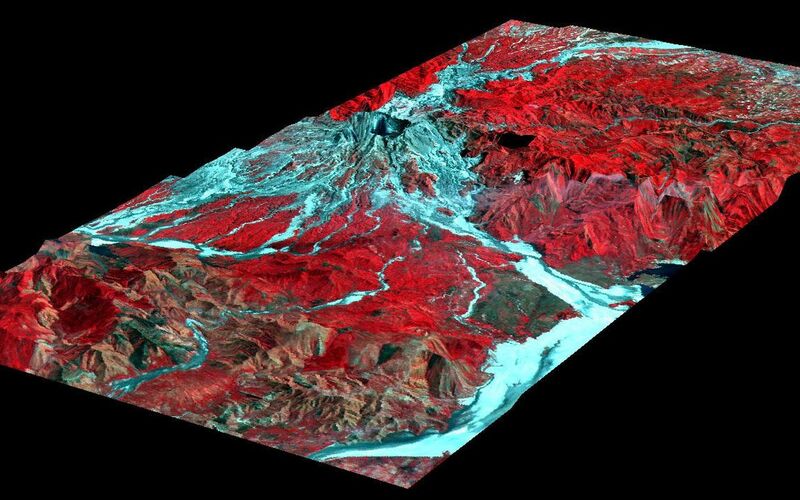 These data sets along with remote sensing data collected from satellites provide valuable information on the dynamic landscape and the hazards that it poses. AIRSAR flies aboard a NASA DC-8 based at NASA's Dryden Flight Research Center, Edwards, Calif. Built, operated and managed by the Jet Propulsion Laboratory, Pasadena, Calif., AIRSAR is part of NASA's Earth Science Enterprise program. JPL is a division of the California Institute of Technology in Pasadena.